For this project, we are particularly interested in investigating possible relationships between landfast ice break-out events and regional and large-scale wind patterns and resulting pack ice drift. While examining individual sea level pressure (SLP) fields associated with break-out events is instructive, an approach that is more quantifiable in terms of possible relationships is desirable. To provide this, we make use of Self-organizing maps (SOMs) (Hewitson and Crane, 2002; Reusch et al., 2005). This neural net-based unsupervised classification technique is based on a 2-dimensional array of nodes, where each node is trained to identify spatial patterns of SLP. Each daily SLP field is then assigned to the best-matching SOM. 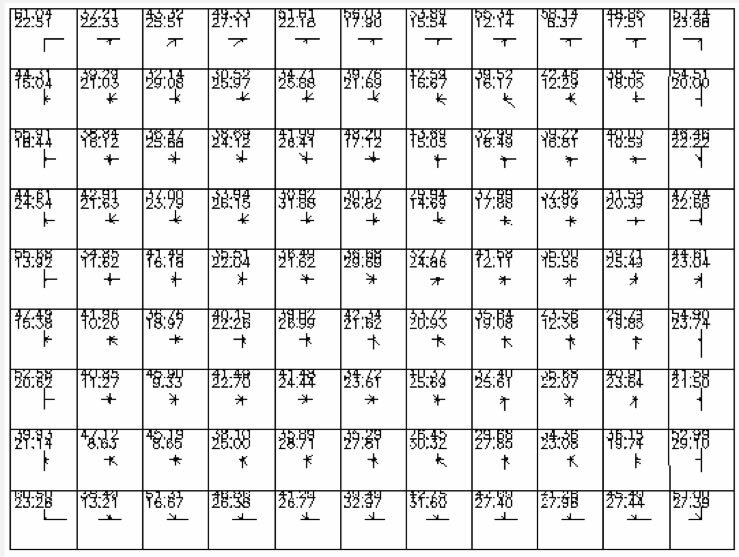 Here we used an 11 x 9 matrix (yielding 99 potential patterns or maps) [e.g., Cassano et al., 2006; Barry and Carelton, 2001] applied to daily NCEP Reanalysis SLP fields for January 1948 through December 2010. The frequency of occurrence (i.e., the total number of times a particular SOM is matched to an individual day over the 63-year period) is provided in Table 1. 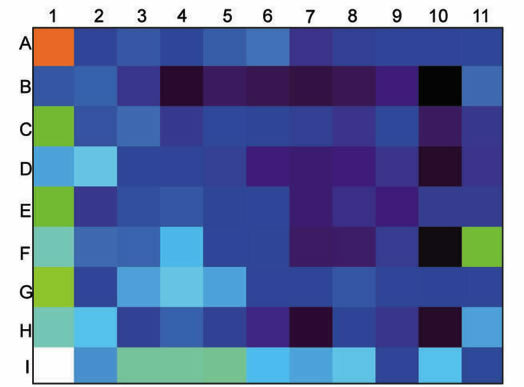 Displaying these counts as a "frequency map" Figure 2) helps illustrate that the SLP patterns represented by the SOMs on the left side of the SOM array in Figure 1 and Table 1 are more common than those toward the middle and right, with SOM I1 occurring most often, followed by SOM A1. In other words, the most frequently occurring SLP pattern is one where low pressure dominates the Arctic as a whole, following by a pattern with high pressure over the Canadian side of the Arctic. Table 1. Frequency of occurrence of each SOM. Figure 1. Self-organizing map patterns defined using daily sea level pressure for Jan. 1948-Dec. 2010. Figure 2. Representation of the frequency of occurrence (total count of occurrence over the 63-year period) for the 99 SOMs. Warmer colors indicate higher frequency, with maximum and minimum occurrences represented by white and black respectively. The relationships between SLP patterns and time of year is shown clearly in Figure 3), with a general progression of patterns from right to left as winter transitions to summer. 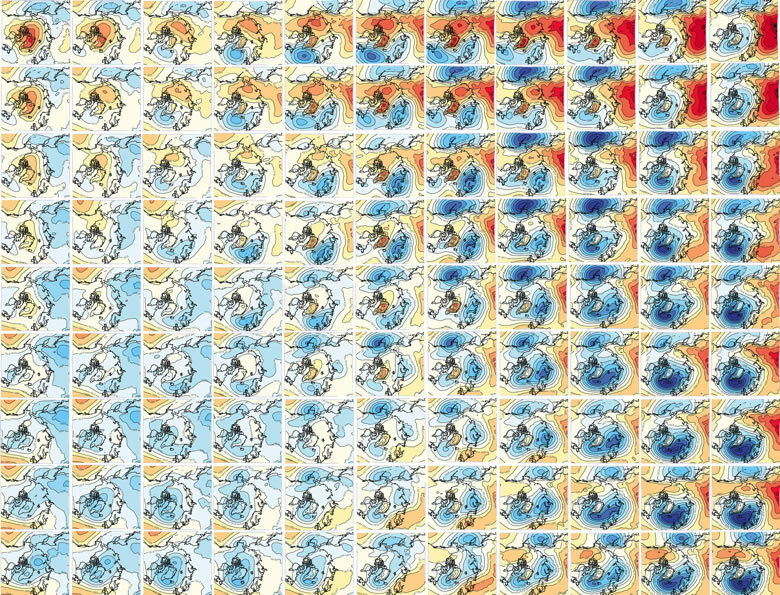 It is also apparent that the variability in summer SLP, as represented by the number of SOMs with relatively frequent occurrence, is considerably less than in winter, with the summer occurrences clustered in the lower left of the SOM matrix. Figure 3. SOM occurrences as in Figure 2, but summed by individual months. Figure 4. Occurrence frequency of individual SOMs by month (top). In the bottom panel, the SOMs given in Figure 1 are provided to facilitate cross-referencing of the SOM frequencies with the individual SOMs. For example, July typically sees a grouping of SLP patterns that correspond to the SOMs in the lower right of the 11 x 9 SOM matrix. For this project, we are using these SOMs in a variety of ways, including searching for key individual SOMs and/or sequences of SOMs that might be linked to likelihood of fast ice break-out. Preliminary examination of SLP patterns leading up to break-out events has suggested some possible relationships in terms of how the wind patterns set up prior to break-out events and shift during the days leading up to the break-out. One useful feature of the SOM process that helps facilitate this type of "progression of winds" analysis is that it is possible to calculate what the tendencies are in how SLP patterns transition from one day to the next. In other words, it is possible to say how likely it is that a particular SLP pattern will follow other patterns in time (Figure 5). Figure 5. SOM transition map. The lengths of the line segments in each SOM's cell indicates the frequency to which the that SLP pattern transitions to the SLP pattern of the adjacent SOMs. For example, SLP represented by SOM A1 is most likely to be followed by SLP conditions represented by SOM A2, with little likelihood of shifting to SOM B2. Also provided in each cell is the frequency in percent that the SOM stays the same from one day to the next (top number in each cell) and the frequency with which SLP transitions to a SOM that is not adjacent (bottom number). For example, SOM A1 is a relatively stable pattern, with that SOM persisting 61% of the time. Barry, R.G. and A.M. Carleton (2001), Synoptic and Dynamic Climatology, Routledge, London, 620 pp. Cassano, E.N., et al. (2006), Classification of synoptic patterns in the western Arctic associated with extreme events at Barrow, Alaska, USA, Clim. Res., 30, 83-97. Hewitson, B.C. and R.G. Crane (2002), Self-organizing maps: applications to synoptic climatology. Clim. Res., 22, 13-26. Reusch, D.B., et al. 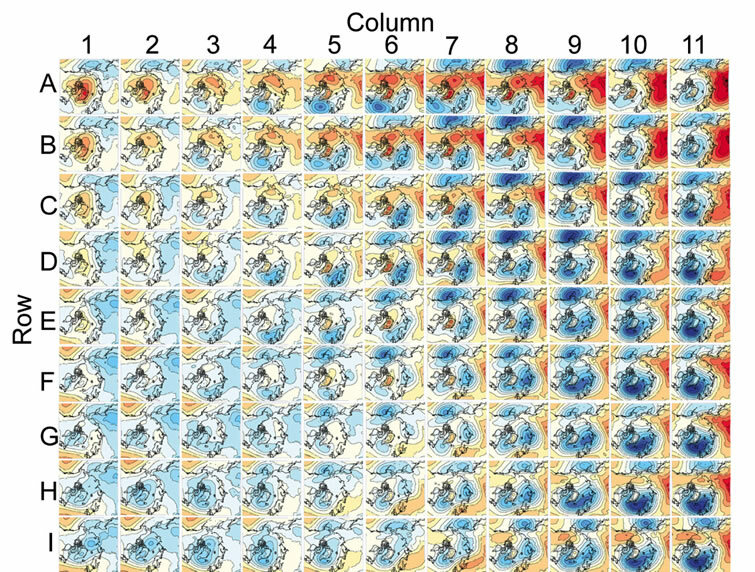 (2005), Relative performance of self-organizing maps and principal component analysis in pattern extraction from synthetic climatological data. Polar Geogr., 29(3), 188-212. This project is supported by the Nation Science Foundation, Arctic Natural Science Program.